What exactly are these companies trying to solve? How are the established Financial Institutions and Banks perceiving them? There could be a ton of questions I could help answer but what I aim to do through this article is introduce you to the Indian landscape of Lending Fintech and a quick SWOT analysis of it. This should be able to give you a sense of direction on what the future beholds for them!! They can be further categorized into Direct lending and Marketplace/Peer-to-Peer (P2P) lending. Fintech companies which follow the direct lending model solicit the customer directly via a web enabled channel, the loan is underwritten and then disbursed to the customer’s account. These companies are funded by Angel investors majorly. In P2P lending, the Fintech company merely acts as an aggregator platform bridging the gap between Borrowers and Lenders who interact amongst themselves to decide on a mutually agreeable rate for their transactions (Loans). This provides an opportunity to the borrowers to get their requirements funded at viable rates and help lenders get the best possible returns on their investments. They charge a commission from both the debtor and the creditor when the agreement finalizes. The credit risk is borne by the creditor/lender. The next big question is whether Banks perceive the Fintech companies as a threat. The answer is yes and no. For traditional banks who are facing penetration challenges, the proliferation of these companies is a matter of grave concern. However, the fact that the brick & mortar model is inevitable in sustaining long term customer relationships which in turn leads to cross-sell, negates the threat to a good extent. In my opinion, the conservative attitude of traditional banks towards digital & tech spend kind of creates a conducive environment for Fintech companies to mushroom. There is plenty to leverage on. New age banks mostly in the private sector do not perceive tech disruption as an intimidation. The primary reason is they are themselves heavily invested in technology and are more than happy to partner with such companies. Paytm, India’s largest payments platform has partnered with ICICI Bank, the country’s largest private sector bank by consolidated assets, to jointly launch ‘Paytm-ICICIBank Postpaid’ the most seamless way to access interest-free short-term digital credit. This new offering will enable millions of Paytm customers to get access to instant credit for the first time for everyday use-cases ranging from movies to bill payments to flights to physical goods. This is the country’s first tie up between a Scheduled Commercial Bank and a payments platform to offer digital credit to customers of the commerce platform instantly. SBI partners with BankBazaar, an online financial product aggregator. Through this partnership, SBI aimed at creating an online platform for home buyers. The online platform makes the mortgage loan application process easier. Also, this platform will generate leads, provide door-step delivery and speed up the response time for SBI. Bank of Baroda partners with CreditMantri for lending to first-time borrowers, SMEs. Public sector lender Bank of Baroda on Monday announced that they will be using alternate data sources for lending decisions in partnership with Creditmantri, a Chennai based fintech startup. With this partnership Bank of Baroda can also lend to SMEs in a real-time basis. Fullerton India partners with Financial technology start-up CreditVidya to offer alternative data-based authentication and verification services, to improve the efficiency of loan processing. The above examples clearly indicate the changing face of digital India. Yes, we have a long way to go as compared to the far west, but the start has been bullish with a lot of momentum. RBI’s proposal to draw a fence around the Fintech companies’ functioning has received mixed reactions from the fraternities. Purists believe that the formalization of these entities will lend more credibility to them which in turn will bolster the average Indian’s confidence to shop for a loan on the internet. Ambiguity related to bearing the credit risk will certainly be minimized. I personally believe that the baby steps have been curtailed way too early. RBI should have ideally allowed them to partially mature, assess the actual disruption by applying objective parameters and then should have intimidated them. I also believe that alternative methods to assess credit is as good as the traditional bureau way. While they would continue to expand on the collaboration front, their ultimate objective of attaining an individualistic identity might take a hit. However, I would like to finish with a note that is typically diplomatic – Only time will tell the Future!!! 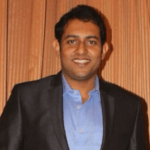 Anwesh is a Principal Product Consultant with 6+ years of experience in Lending domain as a consultant across geographies.